Central Library, Amsterdam, the Netherlands, 2007. Architect: Jo-Coenen & Co. Architecten. Felt walls designed and made by Claudy Jongstra. Wool, silk. This exhibition will explore the varied new uses of felt—an ancient material, believed to be one of the earliest techniques for making textiles. Made by matting together wool fibers with humidity and friction, felting requires little technological expertise and is an extremely versatile material. The exhibition will begin with historic examples of felts, showcase innovations in handmade felts, and feature contemporary uses of industrial felt in a range of fields, including product design, fashion, architecture, and home furnishings. The exhibition is being organized by Susan Brown, assistant curator, Textiles. 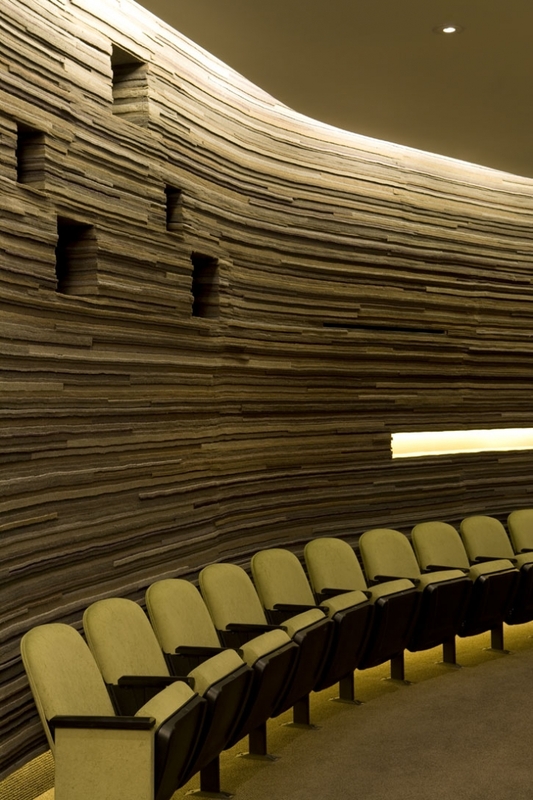 Wosk Theater, Simon Wiesenthal Center Museum of Tolerance, Los Angeles, CA, 2007–08. Architect: Yazdani Studio of Cannon Design, Mehrdad Yazdani, Design Principal; Paul Gonzales, Project Manager; Jessica Yi, Project Architect; Hansol Park, AIA, Senior Designer; Jeremy Whitener, Project Designer. Felt walls designed and fabricated by Kathryn Walter of FELT Studio. 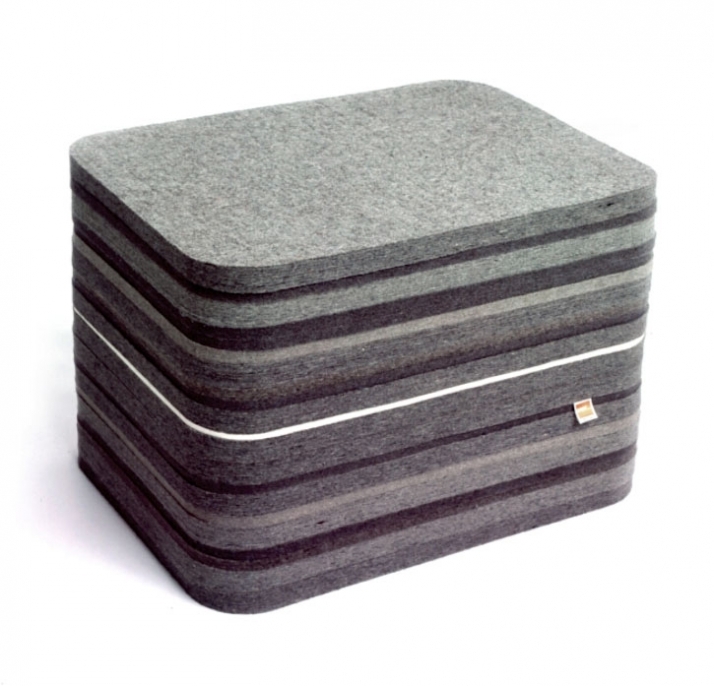 Industrial felts (wool and recycled fibers). The Smithsonian’s Cooper-Hewitt, National Design Museum will present the exhibition “Fashioning Felt,” a comprehensive overview of the varied uses of felt in contemporary design, in the first-floor galleries from March 6 through Sept. 7, 2009. The exhibition will feature more than 70 felt works from a range of fields, including fashion, architecture, product design and home furnishings. Organized by Susan Brown, assistant curator in the Textiles Department, the exhibition will begin with historic examples of felts, showcase innovations in handmade felts, present the issue of sustainability through the re-use of waste wool and felt and explore the recent adoption of felt by a wide variety of architects and designers, from Gaetano Pesce to Tom Dixon. 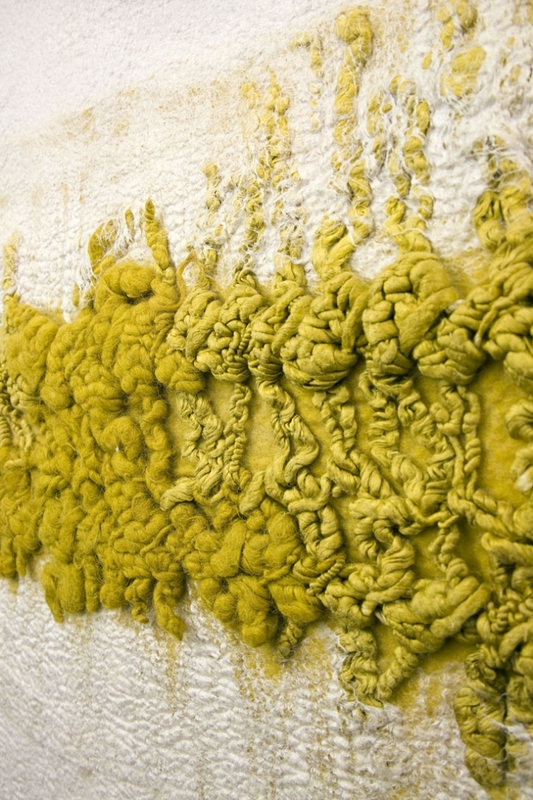 A highlight of the exhibition will be site-specific installations by two of today’s leading hand-felters, Janice Arnold and Claudy Jongstra, who create an incredible range of surface textures through the inclusion of wool from sheep with different coat qualities and experimentation with natural dyestuffs and other techniques, such as felting through silk. At Cooper-Hewitt, Arnold will create a palace yurt, inspired by the traditional dwelling of the tribal leader, in the museum’s conservatory. The yurt will have a ceremonial entrance, and the surrounding glass walls and ceiling of the conservatory will be draped in a soft, felted material of Arnold’s creation. For the exhibition, Jongstra, a Dutch designer, will create two distinct semicircular environments out of her renowned handcrafted, long-haired felt, made with wool shorn from her own herd of sheep. Winged Vessel cup. 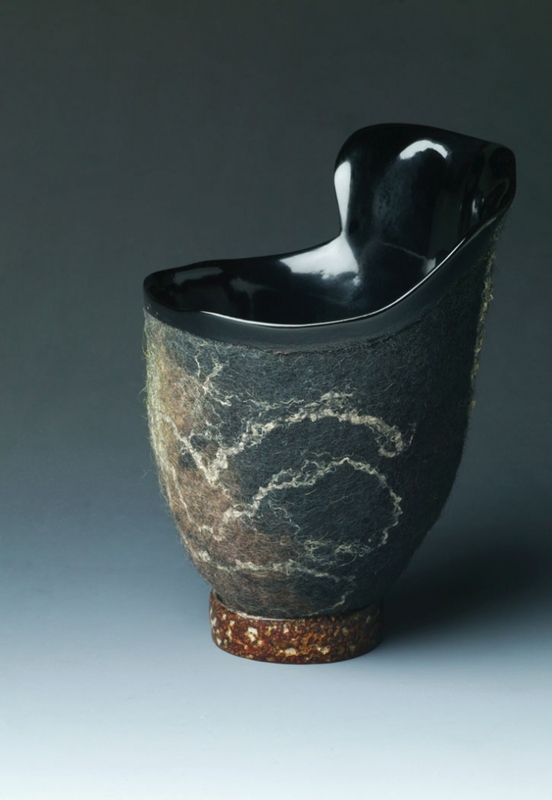 Felt made by Jorie Johnson, urushi lacquer by Clifton Monteith. Japan and United States, 2004. Wool, bast fibers, leaf, urushi lacquer. Made from a renewable resource, the manufacturing of felt is low-impact and virtually waste-free; it is made simply by matting together wool fibers with humidity and friction. The methods of matting felt vary widely, from handmade versions created by violently slamming a fleece roll against the ground to industrial felt produced by mechanically rubbing together wool fibers, but all involve extreme agitation and pressure in order to compact and shrink the felt. Known since at least the Neolithic period (9000 B.C. ), felt is believed to be the first man-made cloth. It was the single most significant material for the nomadic tribes of Central Asia and was used to make everything from clothing to the flexible, collapsible dwellings known as yurts. To illustrate the diverse uses of the material, as well as the continuity of the felt-making technique throughout history, the exhibition will feature animal trappings, carpets and shepherds’ cloaks. Bless You chair. Designed and made by Louise Campbell. Denmark, 1999. 10mm technical felt and 750 sheets of gelatin. As a raw material, felt offers endless possibilities for designers today. The past 15 years have been a period of intensive experimentation and innovation in the craft, and the use of felt has expanded outside of traditional areas to include everything from fashion accessories and costume design to architecture, home furnishings and product design. 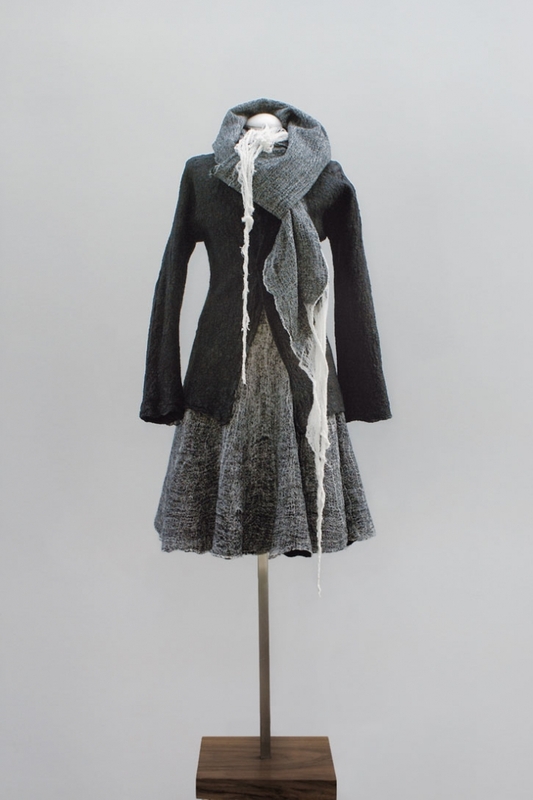 Fashion designers such as Yeohlee Teng and Christine Birkel have embraced felt as a material because it can be manipulated into three-dimensional forms, while still maintaining a soft, textile-like surface. On view in the exhibition will be seamless dresses from artist Andrea Zittel’s “A-Z Personal Uniform Series,” which are formed directly from fiber in three-dimensions, with all color, shape and ornament being executed in the felt-making process; as well as works by Birkel, who creates forms organically by felting through sheer, lightweight fabrics and controlling shrinkage to create necklines, armholes and waists in a process known as nuno felting, rather than constructing garments using traditional dressmaker techniques such as darts, pleats and gathering. In furniture design, textiles are typically relegated to use solely as upholstery, but a dense felt can be firm enough to provide support and structure, while maintaining soft surface qualities. 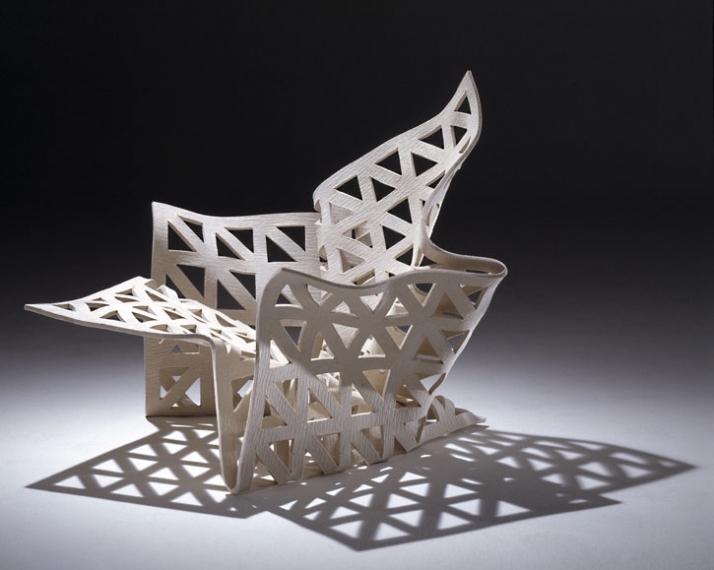 Highlights of the works on view in this area include Søren Ulrick Petersen’s “Swing Low” cradle, whose cocoon-like shape muffles noise and keeps out drafts; Louise Campbell’s origami-like “Bless You” chair; and Pesce’s “Feltri” chair, wherein the back and arms of the chair take shape entirely from the thick, sculptural quality of the felt. 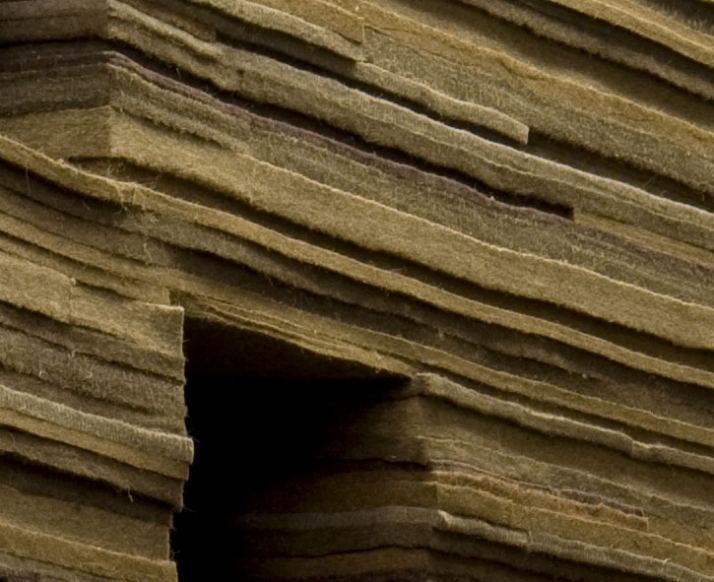 Industrial felt has emerged as a popular construction material in recent years due to its performative qualities of thermal protection, vibration absorption and sound damping, which make it ideal for use as acoustic tiles, wall and floor coverings. The exhibition will spotlight a number of innovative works in this area, including Tord Boontje’s “Little Field of Flowers” carpet, in which six different leaf shapes are die-cut from felt and loomed into a woven carpet, and LAMA Concept’s “Cell LED” carpet, which features LEDs inserted behind the felt nodes in the carpet to provide a long-lasting, low-energy and visually pleasing light source. The exhibition also will address the issue of sustainability, featuring felts made from partially or fully recycled materials. Felt makes a very short trajectory from raw fiber to finished product, creating fewer opportunities for material waste, and with the burgeoning interest in green design, this most primitive textile is emerging as an exciting “new” material. Among the works on view that are created from recycled materials are Odegard’s “Striped Felt” carpet, which is created by embroidering together the waste from various solid-color, cut-edge felt carpets, and Molo’s “Felt Rocks,” a by-product of a process for hardening high-density industrial felts. The final gallery of the exhibition will feature videos that document the felt-making process, as well as a variety of touch samples. A 160-page, full-color catalog, with essays by Brown; Andrew Dent, vice president of Material ConneXion; and Christine Martens, an expert on the ancient art of felt-making in Central Asia, and published by Cooper-Hewitt, accompanies the exhibition. Little Field of Flowers carpet. Designed by Studio Tørd Boontje. Manufactured by Nanimarquina. Spain, 2006. Wool felt. The installation of “Fashioning Felt” is designed by Toshiko Mori Architects. “Fashioning Felt” is made possible by the generous support of Maharam. The exhibition is also funded in part by The Coby Foundation, Ltd., and the Mondriaan Foundation. Support for the Claudy Jongstra installation is provided by Elise Jaffe + Jeffrey Brown. Additional support is provided by the Consulate-General of The Netherlands, the Information Centre of Danish Crafts, The Netherland-America Foundation, The Consulate General of Switzerland in New York, and The Cultural Services of the French Embassy in the United States. Dress and jacket. Designed by Christine Birkle. Manufactured by Hut Up. Germany, winter 2007–08. Wool, cotton. 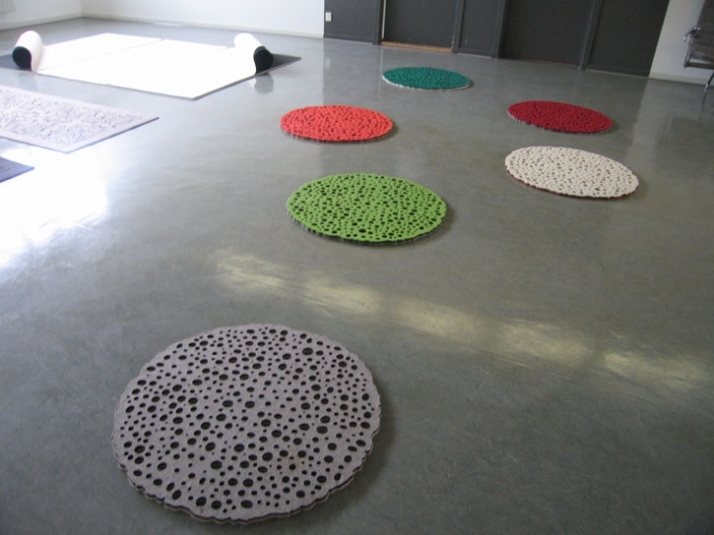 Spot rug. Designed by Majken Mann and Nynne Faerch. Manufactured by Massimo. Copenhagen, Denmark, 2007. Wool felt, rubber.